They celebrate the hundreds of massacres their Zionist terror gangs committed against unarmed Palestinian civilians. They celebrate the murder of thousands of Palestinian children and women. They celebrate their Zionist colonies built on the corpses of Palestinians. They celebrate war crimes, crimes against humanity and genocide. 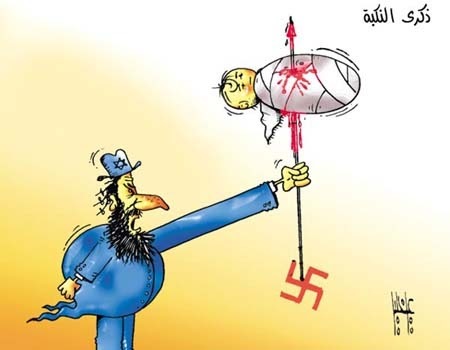 They celebrate the massacres they committed in Jerusalem, Haifa, Ash-Sheikh, Al-Abasiyyeh, Khishkhash, Qazaza, At-Tantoura, Deir daras, Dahmash, Ramleh, Tireh, Sa’sa’, Husseiniyeh, Abu Kbeir, Deir Yassin, Um Ish-Shof, As-Sufsaf, Jeez, Wadi Shubash, Huwwaseh, Al-Lydd, Deir Ayyoub, Kufr Hassiniyeh, Nasir Id-Din, Beit Daras, Yaffa, Ad-Dawaymeh, Yazour, Mansurat Al-Khayt, Qisarya, Wadi ‘Ara, Hawsha, Al-Wa’ra As-Suda, Ein Az-Zaytoun, Burayr, Khubbayza, Abu Shusha, Al-Kibri, Ijzim, Jish, Beir As-Sabi’, Majd Il-Krum, Saliha, Arab As-Samniyeh, Aylaboun, Al-Ba’na, Al-Khisas and many many more. They call it “independence” … and they celebrate the savage murder of innocent Palestinian civilians. We mourn and remember the thousands of innocent Palestinians massacred by Zionist terror gangs. We mourn and remember the thousands of women and children murdered in their own homes. We mourn and remember the thousands of Palestinian men murdered while defending their homes and their families. We mourn and remember the pregnant Palestinian women who were bayoneted in front of their children by Zionist terror gangs. We mourn and remember the Palestinian children butchered in front of their mothers. We mourn and remember the Palestinians murdered as they tried to return to their villages. We mourn and remember the Palestinians who were killed out of thirst, hunger and illness after they were forced out of their homes. We mourn and remember the thousands of Palestinian fathers, mothers, grandfathers, grandmothers, uncles, aunts, brothers, sisters, cousin, nephews, nieces, sons, daughters, grandsons, granddaughters tortured before being massacred and their bodies mutilated. We remember the Zionist massacres and mourn the Palestinian victims. We call it Nakba … And we swear; never to forget, never to forgive.They celebrate the destruction of tens of thousands of Palestinian homes. They celebrate the destruction of Palestinian olive fields. They celebrate the destruction of Palestinian groves. 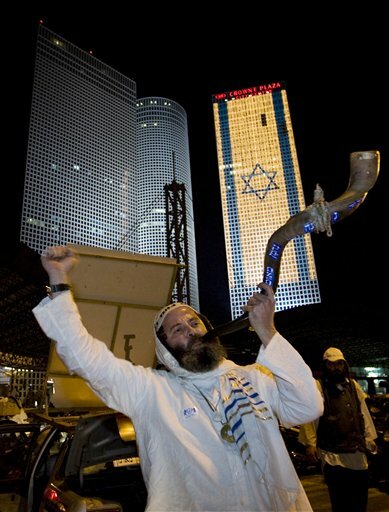 They celebrate the destruction of Palestinians property, businesses and gardens. They celebrate blowing up building, cinemas, kindergartens, schools, restaurants, hospitals and placing bombs in markets, cafes, bus stations and residential areas. They celebrate the destruction of ancient Palestinian towns and villages. They celebrate erasing over 530 Palestinian small towns and villages off the face of the earth, completely defacing them. They celebrate building colonies and planting forests on the ruins of Palestinians homes and villages. They celebrate converting Palestinian towns into Zionist colonies, and changing their names to bury the truth. They celebrate looting and plunder of Palestinian property, land and natural resources. They call it “independence” … and they celebrate the destruction of Palestinian lives, homes and livelihoods. We mourn and remember the tens of thousands of Palestinian homes demolished by Zionist terror gangs. We mourn and remember the warm ancient houses, the beautiful herb gardens, the historical squares and arches made into rubble by the Zionist terror gangs. We mourn and remember the green meadows turned into ashes, the uprooted millions of olive trees, apple trees, apricot trees, carobs, fig trees, orange trees. We mourn and remember the harvest stolen by the Zionist terror gangs while Palestinians were left to starve. We mourn and remember the Palestinians groves stolen and proclaimed as “Zionist miracle of making the desert bloom”. We mourn and remember the over 530 Palestinian villages completely defaced and ethnically cleansed by Zionist terror gangs. We mourn and remember ‘Allar, ‘Artuf, Bayt ‘Itab, Bayt Mahsir, Bayt Naqquba, Dayr Aban, Dayr Yasin, Jrash, Al-jura, Al-Maliha, Al-Qabu, Qalunya, Al-Qastal, Ras Abu ‘Ammar, Al-Bassa, Al-Birwa, Danna, Kafra, Sirin, Al-’Imara, Al-Jammama, Al-Khalsa, Bayt Daras, Isdud, Julis, Al-Jura, Al-Khisas, Al-Jalma, Al-Mansi, Qisarya , Al-Tantura, ‘Ajjur, Bayt Jibrin, Bayt Nattif, Al-Dawayima, Zakariyya, Bayt Dajan, Saqiya, Yazur, Al-Lajjun, Al-Mazar, Ma’lul, Al-Mujaydil, Saffuriyya, Abu Shusha, Al-Burj, Dayr Ayyub, Qazaza, Al-Dawwara, Kafr Bir’im, Sa’sa’, Yarda, Hittin, Lubya, Al-Majdal, Fardisya, Al-Jalama, Wadi Qabbani and many many more. 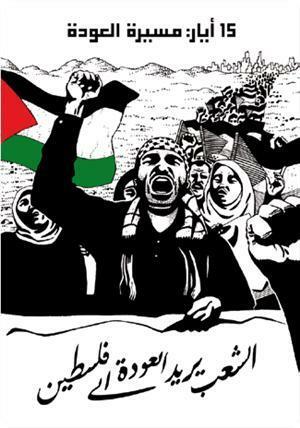 We call it Nakba … And we swear; never to forget, never to forgiveThey celebrate the ethnic cleansing of Palestine. They celebrate expelling 80% of the indigenous population of Palestine from their homes and making refugees out of them. They celebrate usurping Palestinian homes, occupying them and claiming them their own. They celebrate stealing Palestinian culture, stealing the thob, the dabkeh, the dal’ouna, the falafel and the zaatar and zeit. They celebrate massacring Palestinian literature, strangling Palestinian poems and deleting Palestinian thoughts. They celebrate oppressing the Palestinians who remain steadfast in their ancestral homes, on their ancestral lands. They celebrate treating the Palestinians like slaves in their own homeland, on their own land. They call it “independence” … and they celebrate erasing everything that is Palestinian. We remember those who were expelled from their homes. We remember those who died in exile dreaming of their home, dreaming of Palestine, dreaming of the day they return. We remember those who wait, dream and hope, year after year, and swear never to forget, never to forgive. We remember those who teach their children that no matter where they are born in the exile, their blood is Palestinian, their hearts beat only for Palestine, that they are and forever will remain Palestinians. We remember those who live in over-crowded refugee camps, those who refuse the sell out their rights, refuse to go anywhere but return to their ancestral homes, who say out loud despite all the conspiracies and all the temptations: The right of Return is Inalienable. We remember our grandparents, their memories of their ancestral homes, our legacy, carved in our hearts. We remember their words, we remember our promises to them; one day to liberate Palestine, rebuild the homes and repopulate the villages and replant the fields and the groves. We remember and repeat every day, every hour, every minute, every second, until Palestine is free: No peace without justice, and no justice without the right of return.